Had a great time up at “Rippville” I hope to sneak a few more hunts in before the snow flies. Where at, I don’t know yet. 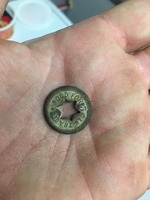 Found this neat trade token mentioned earlier.